Borderlands , from Gearbox software, blends FPS with RPG and tickles the loot center in every gamer’s brain. Borderlands is a good game, but misses greatness in every single category. Fortunately, there is a shitload of guns to make up for it. Borderlands has all the makings for a great RPG: interesting characters, progression, and a story. Unfortunately, Borderlands is the king of “almost”. The characters, like Dr Zed, come with great introduction scenes, but are quickly limited to dialogue boxes only. Other NPCs stand still, not moving, and often blend so well into the scenery that players walk by without noticing them. The only characters that stand out are the R2-D2 inspired robots nicknamed "claptraps" and some random chick that appears on screen to provide dribbles of information throughout the player's journey. The story is fun to think about, but is not a draw for the game. It ends abruptly and does not make use of the characters or game world very well. The world itself will often make a better story than what is being sold by the random chick that pops up on the screen. The pieces are there, but the story is never put together firmly. The loot is really the only RPG staple that stands out in Borderlands. It randomizes the look, stats, and effects of each weapon. With any randomized system, there is a lot of junk that is worthless, but getting a rare weapon is a treat. Getting to use that weapon to take down a giant mammoth-like Rakk Hive is icing on the cake. 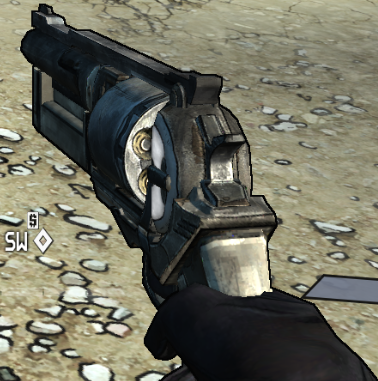 The FPS portion of Borderlands is solid and there is no RPG trickery to spoil the action. It delineates from the standard FPS-fare in a few areas. All weapons have a cone of fire, whether looking down the sights or firing from the hip. This creates the illusion of being able to aim with pinpoint accuracy, when in fact there is a set of numbers in the background determining a shot’s accuracy. 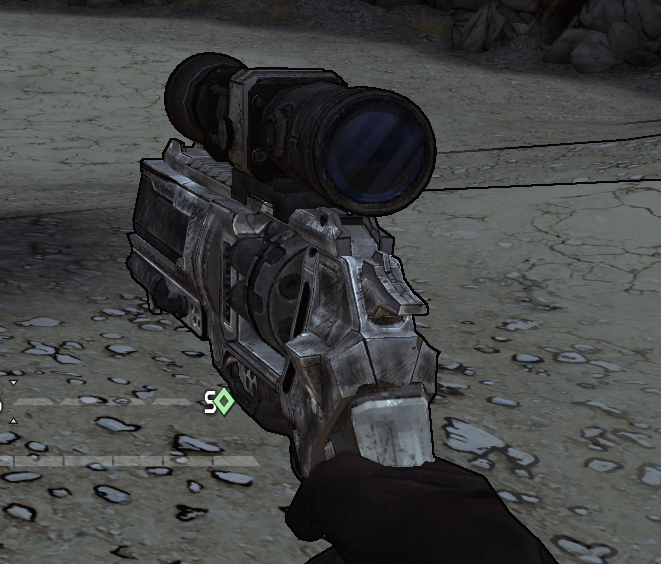 This is most noticeable on sniper rifles, which often fail to hit what they are aimed at. I gave up on using sniper rifles midway through the game as my non-scope pistols were often more accurate. The weapons offer great variety. There is no single super weapon in the game that dominate all others (unless a save file is hacked). Characters aren't restricted from using any weapon type, even if their class skills don't benefit from a certain type. This allows every character to enjoy the awesome loot they acquire. I’ve avoided discussing the multiplayer aspects of Borderlands up to this point. To be brief, the PC version of Borderlands is impossible to play online. The peer-to-peer technical stability is lackluster. In order for games to be properly hosted, the host needs to have more port forwards than most residential-class routers will allow. Secondly, the game browser is nothing more than a list of player-generated room names that do little to help a player find a game they can participate in. Next, once in a multiplayer match, there is nothing to stop hacked save files from entering your game and ruining the fun. Lastly, for a loot-centered game, there are no controls to stop ninja looters from looting the map clean while the other players are beat down by the end-map bosses. But does this even matter when the game is so easily hacked via the saved game files? I strongly urge anyone playing Borderlands on the PC to play with friends only. A couple months after release and one of 2009’s biggest games often has ZERO online games available for the PC. I have not tried any of the Borderlands DLC and have no plans to. It comes with restrictive DRM and that's a no-buy in my book (especially when I am buying it through the DRM known as Steam). The action is consistent and there is never a lack of something to do. With multiple playthroughs, the game scales the difficulty to keep it fresh. By the 3rd playthrough, some encounters become amazingly tough and beating the game becomes a reward by itself. I would recommend anyone who is interested in an FPS/RPG hybrid to give the game a try, but don't expect great multiplayer on the PC without a little technical wizardry first. Overall, Borderlands is fun to play and is almost a great game.